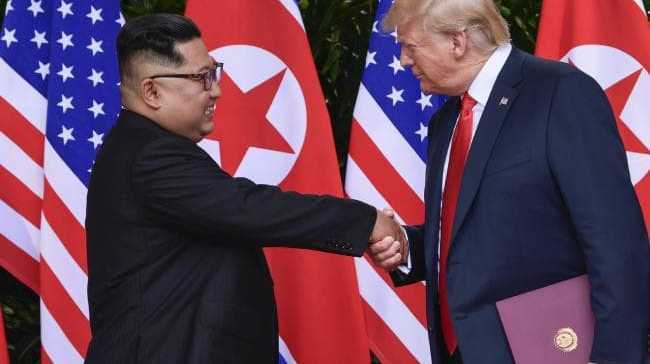 US President Donald Trump said the United States would be at war with North Korea "if not for me" and his relationship with leader Kim Jong Un - even as reports say the regime continues to work to develop its nuclear arsenal. "Many good conversations with North Korea - it is going well! In the meantime, no Rocket Launches or Nuclear Testing in 8 months," he wrote on Twitter overnight. "All of Asia is thrilled. Only the Opposition Party, which includes the Fake News, is complaining. If not for me, we would now be at War with North Korea!" Many good conversations with North Korea-it is going well! In the meantime, no Rocket Launches or Nuclear Testing in 8 months. All of Asia is thrilled. Only the Opposition Party, which includes the Fake News, is complaining. If not for me, we would now be at War with North Korea! The president was referring to the talks that Sung Kim, the US ambassador to the Philippines, ​and his delegation had with North Korean officials over the weekend in Panmunjom, a village on the demilitarized zone separating the two Koreas. ​It was the first face-to-face meeting between US and North Korean officials since Mr Trump's June 12 summit with Kim ​in Singapore. The White House also announced that Secretary of State Mike Pompeo would leave for North Korea on Thursday, the third time he'll be visiting the Hermit Kingdom. But the continued talks come as reports from US intelligence agencies reveal that Pyongyang is continuing to work on its nuclear and intercontinental ballistic missile systems while engaging in negotiations. A number of media reports over the weekend citing intelligence officials said North Korea has no intention of abandoning its nuclear stockpiles, and information gathered since the Singapore summit points to the existence of undisclosed facilities to make material for nuclear bombs. Satellite photos also show North Korea is working on expanding a factory that produces parts for nuclear-capable missiles, the Associated Press reported. "The expansion suggests that, despite hopes for denuclearization, Kim Jong Un is committed to increasing North Korea's stockpile of nuclear-armed missiles," Jeffrey Lewis and Dave Schmerler, researchers at Middlebury Institute of International Studies at Monterey, California, said in a post on Monday. Mr Trump, who tweeted after his summit with Kim that Americans could "sleep well tonight" because ​he has reduced the threat, said he believes Pyongyang will keep its word to disarm. ​"​I think they're very serious about it. I think they want to do it," ​he told Fox's Sunday Morning Futures ​in an interview that aired Sunday. "We have a very good chemistry​.​"
This article appeared on the New York Post and has been republished with permission.